Many times when crimping the barb of a fly hook to make it barbless the hook breaks; but that can be avoided. When pliers clamp down on the barb at a right angle to the shank too much pressure is concentrated where the barb was made. 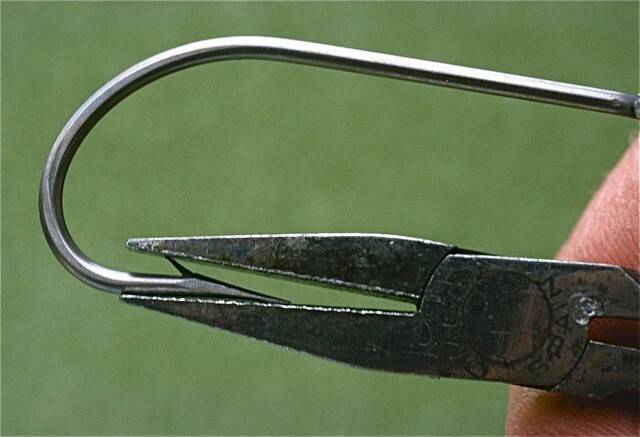 Instead of applying pressure at right angles to the hook shank, if the pliers, hemostats, etc. are placed as shown in the above photo—so the jaws extend beyond the barb and paralell to the shank, the pressure is spread evenly and there is less chance of breaking the hook. I’ve used this technique for years and never had even the high carbon trout hooks break. This entry was posted in Lefty Kreh, Tackle and Techniques Magazine, Uncategorized. Bookmark the permalink.